I enjoyed this show, and I'm glad I got the DVD so I could watch the whole show at once. I didn't have time for it during the regular airing. Now I'll be all caught up and prepared for season 2. Nowadays, most scifi shows on broadcast networks try too hard not to be like a scifi show, and this one is no exception. It's about "real people" and all of the scifi stuff is secondary. That's fine. I like the characters and what happens. I think you will, too. The DVD has some interesting behind-the-scenes features that I enjoyed, and the usual stuff like deleted scenes. Check it out! "SALVATION" is a suspense thriller that centers on Liam Cole (Charlie Rowe, "Red Band Society"), an ingenious MIT grad student, and Darius Tanz (Santiago Cabrera, "Big Little Lies"), a tech superstar, who bring Pentagon official Grace Barrows (Jennifer Finnigan, "Tyrant") a staggering discovery – that an asteroid is just six months away from colliding with Earth. 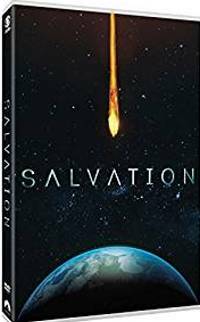 The DVD features all nine hours from "Salvation: Season One" and comes packed with heart-pounding suspense! We need more episode guide recap writers, article writers, MS FrontPage and Web Expression users, graphics designers, and more, so please email us if you can help out! More volunteers always needed! Thanks!